If you’re on a budget, then the options available on your shopping list might be limited. Bodum Brazil becomes a must-buy. It leaves budgeters with a steaming and mouth-watering cup of Joe and hardly anything to complain. French Presses are famed for their tastes. No matter how time-consuming they can be, people with even the busiest schedules are willing to sacrifice their time to taste a perfect cup of coffee. That’s why the coffee produced by B﻿odum Bra﻿zil doesn’t come as a surprise. It has three mesh filters that ensure maximum extraction of flavors and brew coffee even better than certain high-end models. In fact, you can have your coffee either with or without grounds. All you need is to adjust the fineness of them- the coarser they are, the lesser they end up in your cup. It also allows the coffee grounds soak for nearly 4 minutes – making sure that every bit of its flavors are absorbed by the heavenly cup. The manufacturers have successfully tried to reduce their cost without compromising quality. The resulting Bodum Brazil is a simple French Press with a plastic frame that holds the glass carafe firmly in place. If you’re clumsy like me, then I’d suggest you buy this. Neither will the frame bend, nor will it give up on the glass carafe most of the times. Even the lid on top is well-made. It doesn’t come off as you pour it into a cup - saving you the pain of having to hold it tight. Keep in mind that the carafe is not difficult to break. Proper use will definitely prolong its useful life. So make sure not only to handle it, but also to store it appropriately. Bodum Brazil is advertised to be dishwasher safe. But we believe that washing it by hand is in fact easier than loading it into your dishwasher. The parts, especially the filter, come off easily. All you need is to empty it and then rinse the parts with soap water – it’ll be good to go on another run! But since the carafe can resist heat well, you need to be pretty careful when examining it. The heat will not be felt to your touch and a hot pot tends to be more fragile when exposed to cold, running water. Also: Do use something light to stir the coffee inside the carafe. Stirring with metal and hard spoons will easily make it crack. In the meantime, if you do use the dishwasher, make sure you use only the first rack. This way, you can extend the life of the glass carafe. If you add up the bucks spent on your coffee every morning, you’ll realize just how much you get to save with this machine. It may not last the longest, but when it does last, it’ll brew you coffee that tastes better than the coffee from your favorite coffee shop. All things considered : Bodum Brazil has it all. If this is your first time trying a French Press out, then Bodum Brazil could be an excellent choice. It’ll show you just how delicious coffee can get without any hassle. This is the farthest your hard-earned money can go. Mind you: We checked more than a dozen of French Presses in this price range before we crowned Bodum Brazil the best – and none of them could even come close to brewing coffee as good. If you’re looking for a high quality French Press that’ll outlive you, then this isn’t the machine for you. The plastic frame may bend over time, and the glass carafe is definitely, eventually going to break. 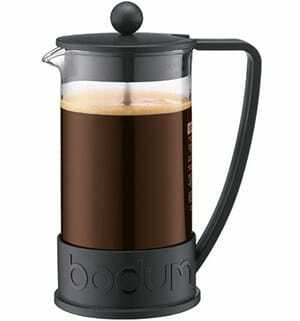 Bodum Brazil is the ideal French Press for budgeters as it comes with an affordable price tag. Not the longest machine to live, but the taste of coffee it brews far exceeds the price. Ease of use comes into the picture as well - making it well worth a buy.